Discover your gifts and live on purpose with inspiring daily five-minute messages from HH the Dalai Lama, Jack Canfield, Sir Ken Robinson, Michael Bernard Beckwith, Marianne Williamson, Sri Sri Ravi Shankar, David Wolfe, Janet Attwood, Mary Morrissey, Shajen Joy, Demian Lichtenstein, and other renowned thought leaders! Volume 1: You are the gift; Your spiritual gifts; The gift; Your guides; Personal journeys; Open up; Your choice; Mandalas and love; Be receptive; Endless possibilities; Transformation; Self-sufficiency; Positive intention; Questions make a difference. 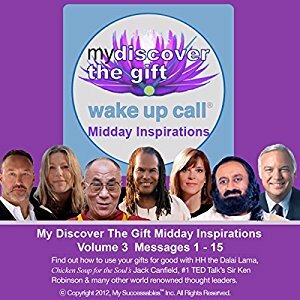 Volume 2: Personal practices; The Dalai Lama; Activate your passion; Compassion, joy, and inspiration; Personal power; Infinite feedback; Transformation; Live to give; Positivity; Peace; TMAwareness; Tune in; My discover the gift. Volume 3: Law of Attraction; Renewal; Yoga-Deep Breathing; Adversity; Transformation; Personal Growth; Meditation; Compassion; Peace; Gratitude-Faith-Love; Love and Action; Law of Love; Love and Gratitude; Forgiveness; Sharing Gifts. My Discover the Gift – Wake UP Call Messages is part of a series of patented inspiring messages invented by former longtime Broadway star Robin Boudreau Palmer. My Wake UP Call® Motivational Alarm Clock® Messages & My Good Night Messages™ are uniquely structured, morning and evening five-minute messages with renowned experts and thought leaders, which bookend every day with inspiration to achieve your personal goals and dreams instead of with blaring buzzers and negative news. 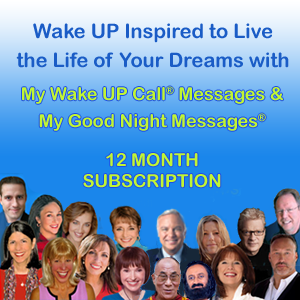 And now, get inspired anytime, anywhere with My Wake UP Call® Motivating Messages and Daily Inspirations! Messages can also be automated to play with free, playlist-playing alarm apps at the Apple Store or Google Play or with a list of recommended apps. Motivational Alarm: “Motivational Messages Plus Alarm, Not Restricted to Wake Up.” My Wake UP Call®, My Wake UP Calls®, and Motivational Alarm Clock® are three of eight registered trademarks of My Successables™ Inc.